Last week there was a little kiosk at my local mall that was selling all sorts of little nail art sticker packs. I naturally bought seven packs, among them, a pack of black and a pack of white kitty cats. 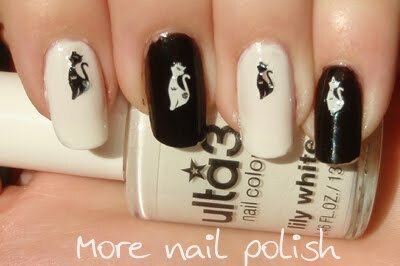 I did up this crazy mani (and only remembered to take photos the next day) using alternate black and white polish and kitties. I also used a different base coat under the black polish (Ulta3 Speed Dry Base and Top coat) and it was terrible. The black polish lifted off in entire sheets, yet the white polish stayed put beautifully. I was a little unco in applying the stickers. I was probably a bit impatient (surprise, surprise) and didn't wait for the polish to dry enough, and then had trouble putting the stickers on with tweezers, particularly lining the sticker up in the right spot. The nail art stickers were great though, and they had little silver diamantes which sparkled well. Don't worry, you'll eventually get the hang of those stickers. :) How much did you pay for them, by the way? There are roughly 50 stickers per pack, and they were 3 packs for $10 or 7 packs for $20. That probably sound expensive to those in the US, but in Australia, that is pretty good. Oh that is so puuuuuuurfect for you! Love it! I love kitties! So cute! Glad you all liked the kitty mani. We have six kitties, so it really was perfect for me. That actually sounded like an amazing deal kitties26! Where I buy mine, there's also a 3 for $10 deal or $4 each, but there's only about 30ish stickers a pack! Am I getting ripped off? :( Oh dear.